Before I went off to Puerto Rico for a too-short winter vacation, I randomly grabbed a couple of African novels at in my university library. As usual my criteria was shorter novels. No point investing a lot of time… so I look for books in the 150 page range. 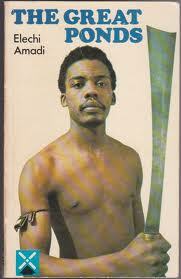 Elechi Amadi had a few novels of the shelf, so I picked The Great Ponds and The Slave. I had never heard of Amadi. Amadi is a tremendous writer. The two short novels are close to perfection, in my view. The writing style is the kind I really like (Alan Garner, Beppe Fenoglio). Short, direct sentences. Description is short and pertinent. Most of each novel is action and especially dialogue. The first sentences suggest the rhythm. For The Slave it is: “Olumati reached the main road and turned right.” Olumati is the central character, and the novel, without giving too much away, is a study in how he returns to his natal village. His return is complicated, for a whole set of reasons. Fate is at work, but he makes lots of choices. You have little idea what the enigmatic title means, “the slave” until the very last sentence. The characters (full disclosure: in both novels women are definitely second-order characters) are well-drawn: believable, complex, nuanced, ambiguous… they confront difficult choices and do not respond like cardboard cutouts. The Great Ponds features a wonderful novelistic device that I also very much appreciate. The book starts off as an insightful exploration of conflict between villages. (All of the structural forces are there, as well as the personal dimensions. Should be required reading for peacemakers!) But then, halfway through the novel, attention shifts. Something else is going on, far bigger than the inter-village struggle. Amadi let’s the reader slowly realize what is happening. The last sentence then is practically shocking: this was true! Both novels are set in pre-colonial Nigeria. No British people in sight. No Christianity. I highly recommend. And if you don’t like one, hey, they are really short and fast reads, both.